OVER 130 NEW WRANGLERS IN STOCK!! *stock # 191257. Lease for only $199 per month for 36 months and $10k miles/year. $5,500 due at signing. Available through US Bank. Tax, Title and Tags not included in vehicle prices shown and must be paid by the purchaser. Restrictions may apply. See dealer for full details. Offer Expires 4/30/19. Billet Silver Metallic 2018 Jeep Wrangler JK Unlimited Golden Eagle 2 Front & 1 Rear Bronze Tow Hook, 3.21 Rear Axle Ratio, 8 Speakers, Auto-Dimming Mirror w/Reading Lamp, Black/Chrome Screws Fuel Filler Door, Body Color Fender Flares, Body Color Grille w/Bronze Accent, Bronze Jeep Grille Badge, Cloth Seats w/Golden Eagle Logo, Connectivity Group, Deep Tint Sunscreen Windows, Driver Height Adjuster Seat, Dual Top Group, Front 1-Touch Down Power Windows, Golden Eagle Hood Decal, Golden Eagle Package, HD Rock Rails w/Step Pad, Heavy Duty Suspension w/Gas Shocks, Light Bronze Accent Stitching, Low Gloss Wrangler JK Decal, MOPAR Black Tail Lamp Guards, MOPAR Grab Handles, MOPAR Slush Mats, Power Convenience Group, Power Heated Mirrors, Power Locks, Premium Tan Sunrider Soft Top, Quick Order Package 24M Golden Eagle, Radio: 430, Remote Keyless Entry, Remote USB Port, Security Alarm, Steel Front Bumper, Steel Rear Bumper, Sunrider Soft Top, Tire Pressure Monitoring Display, Titanium Interior Accents, Uconnect Voice Command w/Bluetooth, Vehicle Information Center, Wheels: 17" x 7.5" Low Gloss Bronze Aluminum. Priced below KBB Fair Purchase Price! We proudly serve Schaumburg, Chicago, Elgin, Hoffman Estates, Crystal Lake and Arlington Heights. We look forward to making your experience at Zeigler Chrysler Dodge Jeep is as easy and enjoyable as driving your new car will be! If you have any questions, don't hesitate to contact us online, or stop by our dealership today! Crystal Metallic 2018 Jeep Wrangler JK Unlimited Golden Eagle 2 Front & 1 Rear Bronze Tow Hook, 3.21 Rear Axle Ratio, 8 Speakers, Auto-Dimming Mirror w/Reading Lamp, Black/Chrome Screws Fuel Filler Door, Body Color Fender Flares, Body Color Grille w/Bronze Accent, Bronze Jeep Grille Badge, Cloth Seats w/Golden Eagle Logo, Connectivity Group, Deep Tint Sunscreen Windows, Driver Height Adjuster Seat, Dual Top Group, Front 1-Touch Down Power Windows, Golden Eagle Hood Decal, Golden Eagle Package, HD Rock Rails w/Step Pad, Heavy Duty Suspension w/Gas Shocks, Light Bronze Accent Stitching, Low Gloss Wrangler JK Decal, MOPAR Black Tail Lamp Guards, MOPAR Grab Handles, MOPAR Slush Mats, Power Convenience Group, Power Heated Mirrors, Power Locks, Premium Tan Sunrider Soft Top, Quick Order Package 24M Golden Eagle, Radio: 430, Remote Keyless Entry, Remote USB Port, Security Alarm, Steel Front Bumper, Steel Rear Bumper, Sunrider Soft Top, Tire Pressure Monitoring Display, Titanium Interior Accents, Uconnect Voice Command w/Bluetooth, Vehicle Information Center, Wheels: 17" x 7.5" Low Gloss Bronze Aluminum. Priced below KBB Fair Purchase Price! We proudly serve Schaumburg, Chicago, Elgin, Hoffman Estates, Crystal Lake and Arlington Heights. We look forward to making your experience at Zeigler Chrysler Dodge Jeep is as easy and enjoyable as driving your new car will be! If you have any questions, don't hesitate to contact us online, or stop by our dealership today! Crystal Metallic 2018 Jeep Wrangler JK Unlimited Sahara 18" x 7.5" Polished Satin Carbon Wheels, 3.73 Rear Axle Ratio, Alpine 9-Speaker w/All Weather Subwoofer, Body Color 3-Piece Hard Top, Body Color Appliques Front Bumper, Body Color Appliques Rear Bumper, Body Color/Accent Color Grille, Class II Receiver Hitch, Connectivity Group, Heated Front Seats, Max Tow Package, MOPAR Dark Gray Leather & Premium Sound, Quick Order Package 24G, Tire Pressure Monitoring Display, Trailer Tow w/4-Pin Connector Wiring, Uconnect Voice Command w/Bluetooth, Vehicle Information Center. Priced below KBB Fair Purchase Price! We proudly serve Schaumburg, Chicago, Elgin, Hoffman Estates, Crystal Lake and Arlington Heights. We look forward to making your experience at Zeigler Chrysler Dodge Jeep is as easy and enjoyable as driving your new car will be! If you have any questions, don't hesitate to contact us online, or stop by our dealership today! Over nine models to choose from. Ride the Wrangler JK at Zeigler Chrysler Dodge Jeep Ram of Schaumburg today. Not sure if buying is right for you? Learn about leasing vs. buying and view our Wrangler JK lease deals before contacting us to schedule at test drive at Zeigler Chrysler Dodge Jeep Ram of Schaumburg in Schaumburg today. Get ready to hit the trails with the 2018 Jeep Wrangler JK. 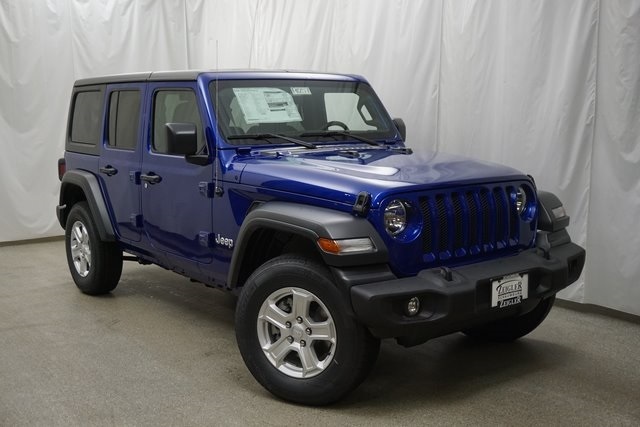 This off-roading ready Wrangler comes with the top-down freedom Jeep drivers love and is available at Zeigler Chrysler Dodge Jeep Ram of Schaumburg near Barrington today. Browse our inventory and then stop by for a test drive to get outfitted for your next adventure.